Just about everyone knows about birthstones…or thinks they do. We’ve been overwhelmingly surprised by the number of folks who approach us at gem shows wanting to know if we have their birthstone for sale. 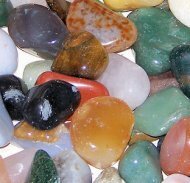 While some people ask us if we know the gemstone associated with the month of their birth, many more already have a notion of the corresponding stone. It’s amazing the variation of “knowledge” about birthstones. But even the confusion has a bit of historical significance. Birthstones are reported to have been based on a particular set of 12 stones that were set into the breastplate of Aaron, brother of Moses. The stones represented the 12 tribes of Israel, the 12 signs of the zodiac, or the 12 calendar months. The only trouble with this story is that the development of the modern 12-month calendar may have come along after Moses and Aaron. But that is another story! The ambiguity has played right into the hand of those who aren’t too happy with the traditional stone of their birth month. If you don’t like the traditional stone, seek out the monthly list of any number of other traditions: Hebrew, mystical, metaphysical, or Ayurvedic. Anyone born in April will likely be happy to know the diamond is their birthstone, and those who are born in December can wear some very nice turquoise jewelry to represent their birthstone. It’s a little difficult to say when the tradition of wearing a birthstone came into being. Some sources cite the practice going back to the 1st century. In those days, a person would wear the stone of the month, changing the stone with the calendar days. The practice of wearing only the stone of one’s birth month seems to have come along much later. No matter what stone you choose or which tradition you follow, it’s fun to pick a special stone just for you. After all, that’s likely all you’ll need to find the Good Luck of a Birthstone!